I had purchased this ripe pu erh cake during my visit to KL, Malaysia last month. I had purchased it from JDX tea distributor Sdn Bhd. JDX is an official Menghai Dayi (officially called 'Tae' now) distributor in Malaysia. I will write more about JDX in my later blogs. This is the Menghai Dayi 7572 ripe cake. This is the 2007 (702) version. 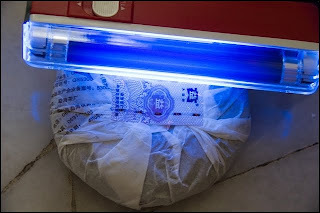 The '7572', which you see on the front cover of the wrapper (pix1) is the recipe name of the pu erh cake. Many popular pu erh cake uses a blend of pu erh tea leaves that are harvested from the various regions of Yunnan, China. Instead of giving a name to a blend of tea leaves, a 4 digit number is used. This is unlike wines where names like Merlot or Chardonnay are used to describe wine 'recipes'. There are many recipe numbers used in making pu erh cakes and some pu erh recipes like 7542 and 7581 are examples of popular pu erh cakes today. Pu erh tea factories will make a number of batches of the same tea in a year. In this case, for a 2007 cake, the 1st production of a 7572 cake will be given an addition code - 701. The second production batch will be 702, which I had purchased. You can see the production batch number on the reverse of the wrapper (last pix) or in recent cakes; on the front of the wrapper itself. Is there a difference in the tea, lets say between 701 and 703? Yes, you can see the difference in the pricing of the tea. A 701 (1st production) will be more expensive than a 703 (3rd production). Tea collectors and speculators will tend to purchase the 1st production of the year (something like a 1st printing of a book). This cake is a 4 year old tea, and the prices for a 701 is almost 30-40% more than a 702. Is there a difference in the taste? I cannot tell you. I do not have the privilege to try the various production batches of a year. My tea friends, even in Guangzhou and Hong Kong, have no experience in this matter, although it is an urban legend that 1st production has better grade leaves than later productions. I will try to find out more though. But I digress. 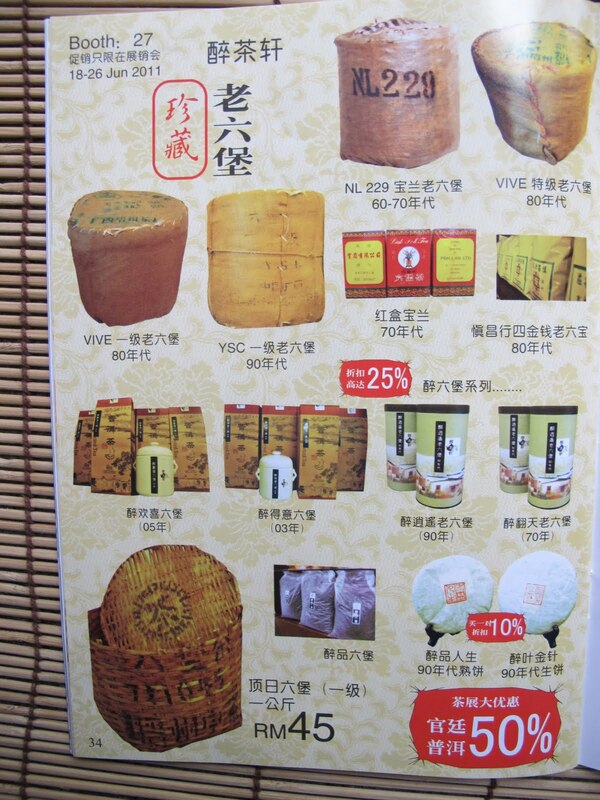 There are sadly fake pu erh cakes being sold at tea markets and tea shops. I have gleaned some information about the fakes and I used the following visual checks to assist me in my purchase of Dayi cakes. Firstly, the wrapper fold should be something like in pix 2, where the final fold of the wrapper has printed information. Secondly, the security sticker should be clearly printed and you can feel the printing on the sticker. Thirdly, there should be 'Dayi' Chinese characters on the silver strips of the stickers. Finally, when you opened up the cake (usually at home, after you had purchased the cake), the inner label should have the silver strips with "Dayi" characters with a line of colored numbers running down vertically on each side of the inner label (pix 5). I know all these pointers I had mentioned are not complete or fool proof but I am currently using these pointers to assist me when I buy the slightly older Dayi cakes. Back to this cake. The aroma is very pleasing. I can understand why this 7572 cake is very popular among the ripe pu erh tea drinkers. The scent seem to signal that the tea will be nice, sweet and pleasing. 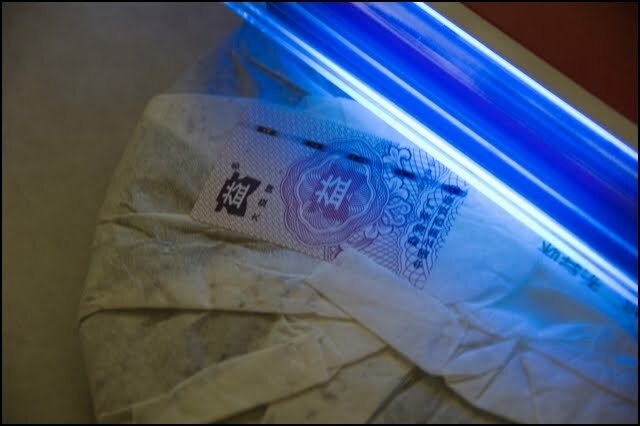 It has a subtle scent of nice chinese medicinal herbs as well. Overall, a nice fragrance and pleasing sweetish aftertaste. This tea brews fast and strong, so adjust the tea leaves and infusion times to your preference. I have no regrets buying this 2007- 702 Dayi 7572 cake. 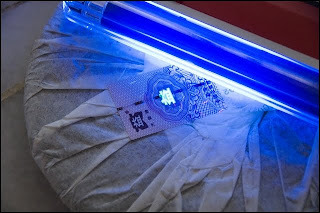 Our Malaysian tea celebrity, Auhckw, bought an UV lamp and shone the light over his Menghai Dayi collection. Pix courtesy of auhckw; who had generously consented to share his findings with us. The 1st 2 pix are '2010 pu erh while the 3rd pix is a '07. The last 4 pix are '07, '08, '09 and '11 Dayi pu erh. This security sticker is a big deal for the Dayi tea collector. There are, sadly, a high number of fake pu erh teas that are sold in the tea markets. This is compounded that a majority of the fakes are Dayi brand of pu erh. 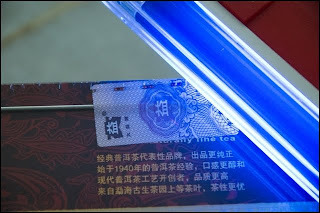 I myself, look at the security sticker, when I buy Dayi tea. For me, I will examine the silver strips on the sticker and look out for the Chinese "大益" on the silver strip as a guide when I buy the tea. Dayi in order to protect the customers from buying fakes decided a few years ago to affix security stickers. 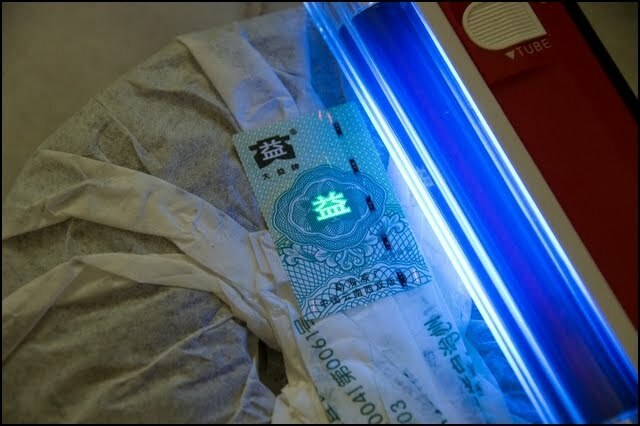 Dayi, informed their dealers and customers the various features of these stickers like the silver strips, die-cut stickers and the stickers having glowing characteristics under a UV light. 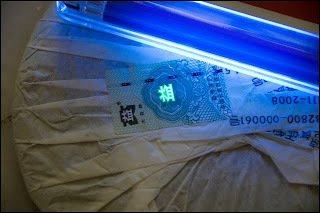 So, are we to conclude, if the Dayi sticker does not glow.....its fake? I do not know the answer. Maybe I might write to Dayi for a clarification. I would like to thank Auhckw for this interesting finding. He had indicated that he will shed more light on this controversy soon. One thing for sure, sales of UV lamps will surge a little. You will see strange lights coming out from the Dayi tea collector's home in the next few weeks. Glow Dayi Glow. Qiu Xiang Tea (M) Sdn Bhd. has 4 tea branches in Malaysia; 3 in KL city and one in Klang. This was one of the tea shops that auhckw had recommended to me to visit during my visit to KL last month. Readers would be familar with 'Auhckw'. Yes, he is the famous contributor of Chinese Tea information on the internet. He is prolific in his contribution on Chinese Tea. He takes lots of pictures and shares much information about Chinese Tea and on the tea market in Malaysia. He impressed me as very thoughtful and generous. A new good tea friend. I had stayed in the Chinatown district during my stay in KL as I enjoyed browsing through the daily night market there. At the night market, I could have a piping plate of fried noodles, select and buy from a wide choice of fresh local fruits, purchase a bag of freshly roasted chestnuts, shop for 'luxury' bags and watches all on one street. And.....in the day, just a street away, there is a cluster of Chinese teashops that made me grin from ear to ear. Qiu Xiang has an outlet on Jalan Sultan. I was there late morning, and a Ms Chen was manning the shop. This tea shop was well organized with a good range of pu erh tea. 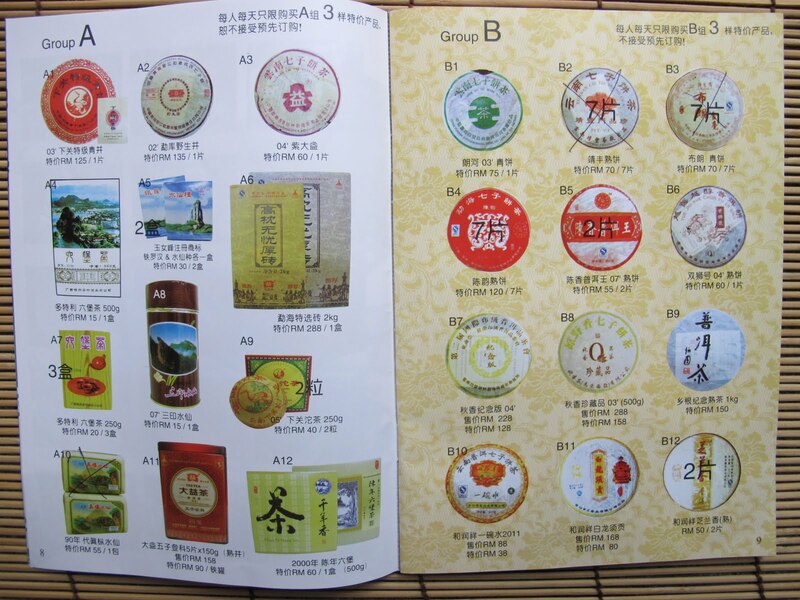 They even have their house 'pu erh' as seen in pix 4 & 5 (they have quite a good range of house pu erh). Ms Chen provided a tea sampling session of their house tea. 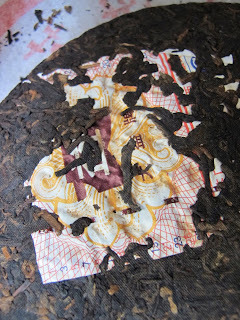 The video showed Ms Chen brewing their house brand '08 ripe pu erh (pix 5). I noticed 2 things about the tea session. The water used was always at boiling point (which I approve). I also observed that the infusion time was quite long.....10 seconds +. She has used about 6-7 g in her gaiwan. She explained that this tea tasted best with a longer infusion time unlike the other ripe teas in the shop. This tea was very good. I left Qiu Xiang happily with 3 cakes of tea. I went to Kuala Lumpur (KL) last week. I would like to take this opportunity to thank my new tea friend, Mr Chua, who uses the nick 'auhckw' in international tea forums. Many tea collectors and enthusiasts would be familiar with 'auhckw' as he is prolific in his posting of news and pictures of the Chinese Tea market in Malaysia. I am grateful that 'auhckw' has been generous in sharing his tea knowledge and makes every effort posting pictures of tea, teapots and other Chinese tea related materials almost on a daily basis especially on teachat.com. I had introduced myself to auhckw early last month and had communicated with him on the internet seeking his expert advice on Chinese Tea. He was very friendly and was able to answer all my queries on tea. He had also mentioned that there was a Malaysian tea expo, held yearly, that would be on in July. He suggest that I attend the expo and even give me pointers on which teashops to visit while in KL. He even offered to accompany me to his fav teashop in one of the afternoons (see later blogs). That week was a quiet week and my wife was on vacation. We were in KL before we knew it. 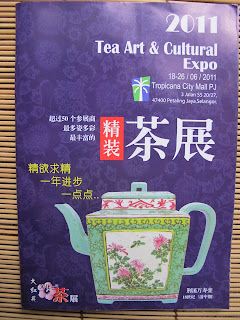 The 2011 Malaysian Tea Art & Cultural Expo was held in Tropicana City Mall. We just took the train and then switch to a complimentary shuttle bus to the mall. The ride there was a breeze. 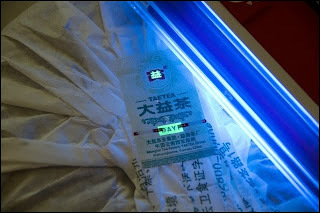 This blog entry is picture intensive and would give you an inkling of the Tea Expo. You must click the pictures for clearer and enlarged views. 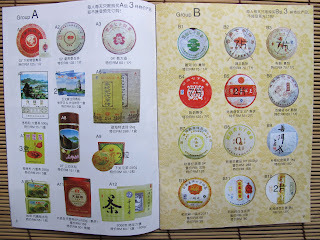 The 1st four pix is a brochure given to visitors of the tea expo. As a treat to visitors, they are allowed to purchase (supposedly at special prices) one item each from Group A, B, and C. Auhckw instructed me to get the Menghai cakes in red tin (2nd pix, lower left). This is the 2011 ripe pu erh. The tin consists of 5 cakes each 150g per cake. Pix 4 shows an ad taken out by one of the exhibitors there. 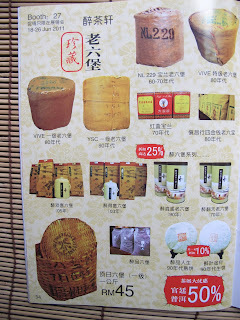 This exhibitor was a teashop specializing in Liu Bao Tea. I purchased some of this aged tea at one of the booths. Visiting the individual booths was interesting. You could sample some of the teas on offer and buy the tea or teaware at special prices. I bought 2 stainless steel tea caddies while moving around the booths (pix 5 & 6). 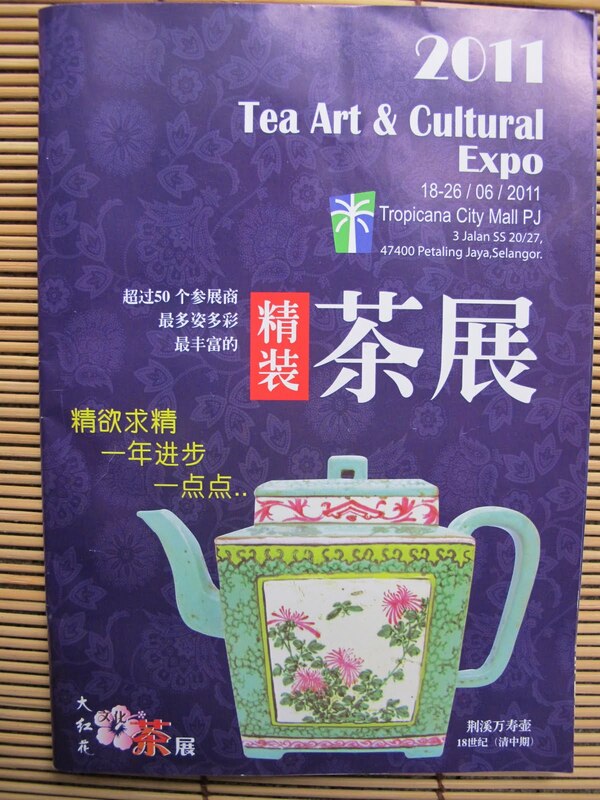 Pix 7 is the teapot that was the main highlight on the cover of the tea expo brochures and posters. Auhckw mentioned that its made from Yixing clay, enamelled and painted on the outside. Qing dynasty period. Pix 8 & 9 was an interesting stop for me at the tea expo. You can buy 200g of raw pu - you choose from different types or grades from the large jars, pay for it and have your tea compressed manually into a cake. 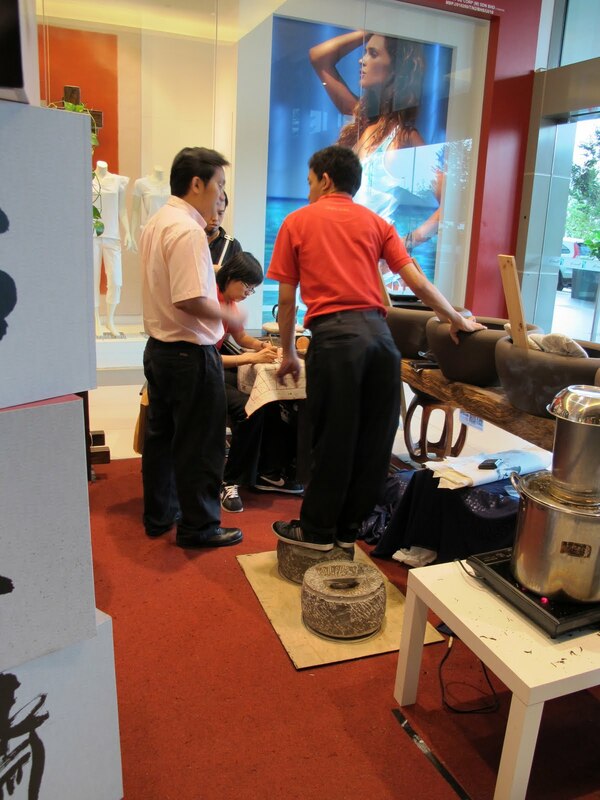 Pix 9 shows an assistant standing on a stone press compressing a tea cake. You can even personalize the tea wrapper for your tea cake. The tea expo was well organized. As it was held in a shopping mall, visitors like me can easily have a meal at one of the many restaurants or fast food joints there. My wife and I had the luxury to do some shopping at the mall before calling it a day. Very enjoyable.